A.J. Bailetti (Antonio J.) and Bot, Sonia D.
Job creation is at the centre of the rationale provided by governments and publicly funded organizations for investing in services purported to support entrepreneurs to launch and grow technology startups. However, little is known about how to design and build the engines that convert these publicly funded services into jobs in a region. 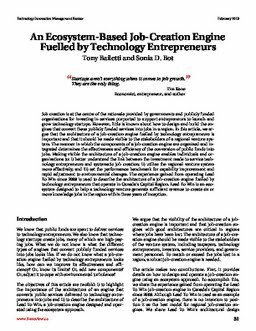 In this article, we argue that the architecture of a job-creation engine fuelled by technology entrepreneurs is important and that it should be made visible to the stakeholders of a regional venture system. The manner in which the components of a job-creation engine are organized and integrated determines the effectiveness and efficiency of the conversion of public funds into jobs. Making visible the architecture of a job-creation engine enables individuals and organizations to: i) better understand the link between the investment made to service technology entrepreneurs and systematic job creation; ii) utilize the regional venture system more effectively; and iii) set the performance benchmark for capability improvement and rapid adjustment to environmental changes. The experience gained from operating Lead To Win since 2009 is used to describe the architecture of a job-creation engine fuelled by technology entrepreneurs that operate in Canada’s Capital Region. Lead To Win is an ecosystem designed to help a technology venture generate sufficient revenue to create six or more knowledge jobs in the region within three years of inception. Bailetti, A.J, & Bot, Sonia D. (2013). An ecosystem-based job-creation engine fuelled by technology entrepreneurs. Technology Innovation Management Review, February.